In Sarkisian v. Concept Restaurants, Inc., an appeal from the Supreme Judicial Court of Massachusetts (SJC), plaintiff slipped and fell at a nightclub in Boston owned and operated by defendant. According to court records, the nightclub was licensed to hold 574 occupants at a time and contained a wooden dance floor, which was approximately 50 feet in length. There were two bars at which employees served alcoholic and nonalcoholic drinks, and these bars were both located on the dance floor itself. One of the bars was 50 feet in length and the other was 15 feet long. Customers were allowed to take their drinks served in plastic cups on the dance floor or drink them in any other part of the nightclub including the lounge area that was accessible by a flight of stairs. Plaintiff and her friends entered the nightclub on an evening when the club was staffed by eight security guards, three bar backs and a manager, in addition to the DJ playing music and the bartenders. All personnel were responsible for making sure the dance floor was cleared of debris and safe for walking and dancing. Plaintiff and her friends danced for several hours without her noticing any liquid on the dance floor. At one point, she was unable to find her friends and went up the stairs to the lounge to see if she could find them there. When she did not see her friends, she went back down to the dance floor. Less than a minute after she was on the dance floor, she slipped on some liquid that had spilled on the floor and fractured her leg in two places. Plaintiff filed a lawsuit against defendant, alleging negligence for failure to keep the dance floor dry and safe. Defendant filed a motion for summary judgment on grounds plaintiff had not met her burden of proof to establish defendant had any actual or constructive knowledge of the wet floor. The trial court allowed defendant’s motion for summary judgment and dismissed the case. Plaintiff then appealed to the court of appeals for the Commonwealth of Massachusetts, and that court affirmed trial court’s ruling. Plaintiff then appealed to the SJC on grounds that in the mode of operation theory in premises liability cases, she had supplied her burden of proof. 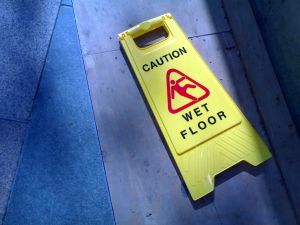 As our Boston slip and fall attorneys can explain, actual knowledge is first hand knowledge of a particular dangerous condition. If an employee actually sees water on the floor, this is considered actual knowledge. Constructive knowledge can come from various sources. Constructive knowledge is created by operation of law and is sometimes called a “legal fiction.” For example, if an employee is responsible for inspecting a floor every five minutes, and there was a spill on the floor during the time of an inspection, employee is said to have constructive knowledge of the spill, whether he or she actually saw it saw under this presumption. Ultimately, the SJC reversed the lower courts’ rulings on grounds the mode or operation theory did apply to premises liability cases, and the club was constructively aware of the inherent risks in choosing to operate in the manner in which they did. In other words, the club owners chose to allow drunk customers to take drinks on the dance floor. They were presumed to know of the risk of a drink spilling on the dance floor.